Eight days ago, Google released a major update to the Layers of Google Earth. Included within the update were several new additions to the "Featured Content" section. I already wrote about the excellent US National Parks layer which includes 10,000 miles of trails. Now, let's take a look at the UNEP's (United Nations Environment Programme) Atlas of our Changing Environment layer. The UNEP Atlas layer can be found in the Layers pane on the lower left of GE under "Featured Content". This layer shows 100 sites in which they compare older photos to current and show how the environment is changing (usually in a very bad way). For example, let's take the Amazon in Brazil. 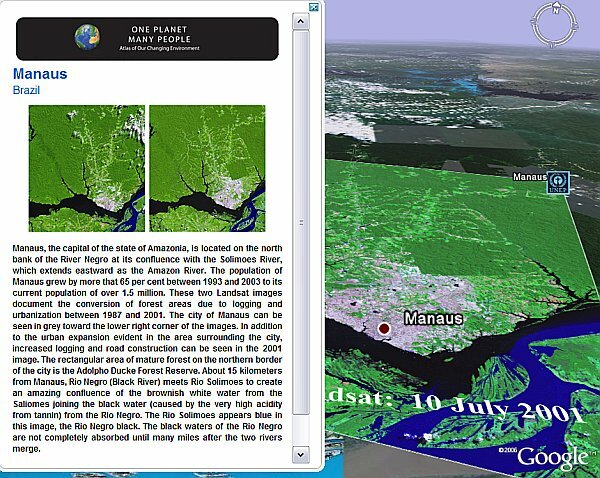 You can open this placemark of Manaus, Brazil . When you click on the placemark, you see a bubble describing deforestation due to urbanization and growth of the nearby city. There is also a link letting you open image overlays showing two satellite photos between 1987 and 2001. The UNEP layer lets you look at 100 sites around the world where the environment has been impacted in this way. A very powerful demonstration of why more people should pay attention to environmental change of our beautiful planet. Here is a review of the UNEP layer by NewScientistTech. NOTE: you can also view a Google Maps version of the UNEP Atlas (see GoogleMapsMania).